The most exciting news that we want to share with you this month is the launching of our new website www.amelias-smartyplants.com. 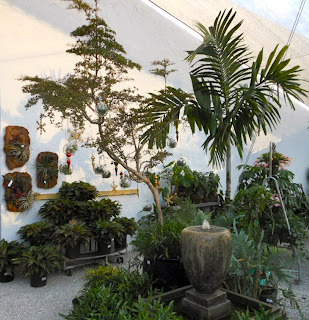 It has been in the making for quite some time, and thanks to Ted Johnson, a fellow Lake Worthian, who kept applying subtle pressure on us to give him information, we now have a web presence with lots of good information and pictures of the garden center. 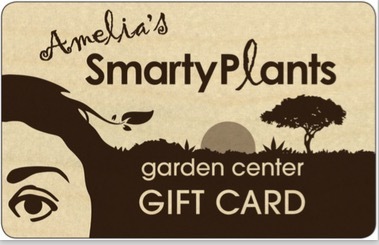 We are grateful to Ted for doing a great job and helping us to get the word out about SmartyPlants. If you sign up to follow us by email, we'll let you know every time we update it. 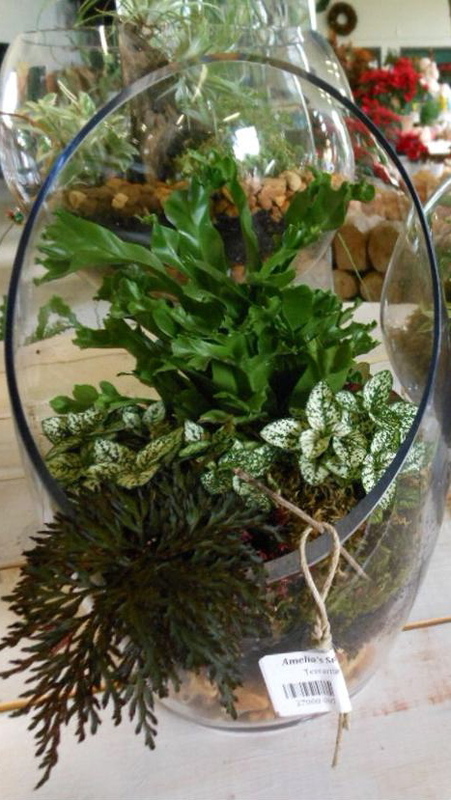 As you start or continue with your holiday shopping, you may consider some unusual gifts like planted Terrariums or Fairy Gardens. You will find lots of stocking stuffers at SmartyPlants. And if all else fails, present your family or friend with a gift certificate. These fairy gardens can be kept near a window or outdoors in shade or semi-shade. They have been drilled for drainage, so even if we are lucky enough to get rain, these fairy gardens are well equipped to handle the elements. A terrarium is an ecosystem in its own and adds life wherever it resides. 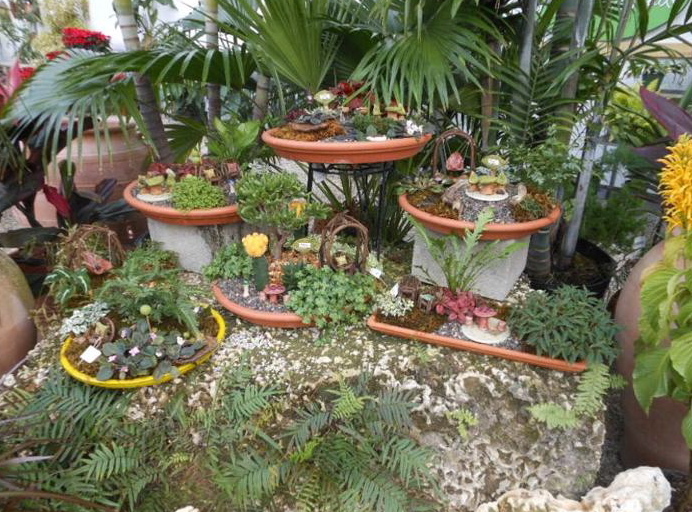 These creations may be kept under a covered porch/patio as they are in glass containers without drainage holes. We have small ones with one or two plants, and very large ones that will swallow you up with interesting nooks and crannies to discover. We enjoy bringing alternative products to SmartyPlants. Let us know if you try the pine straw and what you think of it. There are so many wonderful plants from which to choose, but there has to be ONE that we recommend for its beauty, easy care, butterfly/bee attractiveness, or any other criteria that is appropriate. This month we pick the Florida Cracker Rose for the Plant of the Month - see picture below. Most people think of roses as a lot of work and not very rewarding plants. Although this may be true, we'd like to introduce you to a different kind of rose - the Louis Philippe. This is a Florida native that requires little to no work. It is tough as nails and prolifically produces 2-inch clusters of red blooms all year, but it's particularly happy this time of the year when the air is drier and the temperatures cooler. If you fertilized it earlier in the season, the reward will be grand - a bazillion of red flower clusters. If you forgot about it and didn't fertilize at the end of the summer or early fall, you will only get a gazillion (you won't make the bazillion mark) blooms. 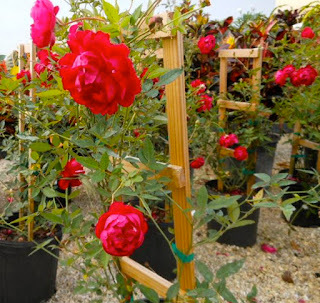 It grows to 4-5 feet on its own but it can be trellised or trained on an arbor for more height. Currently, we offer it as a bush and on a trellis. It's a tried-and-true winner that deserves a sunny spot in your yard. Enjoy your garden, your blessings, your family and your friends; be grateful and be merry. Christmas Eve and New Year's Eve fall on a Monday this year. Please remember that we are closed on Mondays, so be sure to get your last-minute shopping done on Sunday the 23rd. Paul, Marta, and the staff at SmartyPlants wish you and your family a very happy and safe Holiday Season.